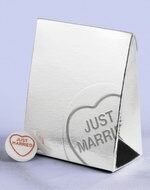 This page features a range of products that may be useful for your gay wedding - including decorations and wedding favours. There are also ideas for wedding presents. From original art work to hand-painted photo frames with the words civil partnership across the top to "his and his" or "hers and hers" champagne flutes. You can also look at our Gift list services section for more ideas. You can also visit our Amazon store, where we have selected a wide range of civil partnership wedding gifts, as well as books, software and music to help you plan your civil partnership. How about some personalised love hearts with your names and the date of your ceremony?